For feeding and dozing of powders and granulates, tablet, capsules, shredded meat, cheese, and a variety of other products. Weigh Fillers model S 500 has proven reliable and accurate performance on a variety of installations. Simple, easy to maintain and clean design delivers trouble free operation and consequently quick ROI (Return On Investment). In order to fulfil specific requirements of production and product characteristics, several options are available. Equipped with One or Multiple weighing heads. are used depending on the product volume. weight, volume, and project requirement. 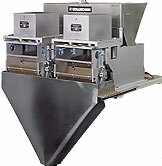 Weigh Filler specifically weighs and fills free flowing pieced, granular or powdered products. The product amount to be filled is determined in the target weight range. S500 filling function guarantees that at least a certain minimum weight is filled. 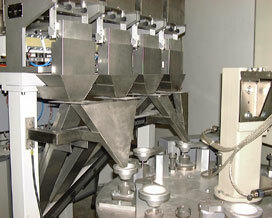 Product dosing process over a vibrating chute. 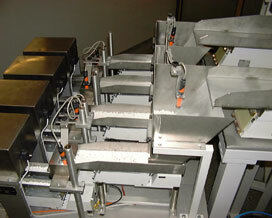 Product flow and filling speed is controlled by the vibration amplitude. Weight determination proceeds with the help of DMS (Dynamic "weight" Measurement System) cells. The product is filled into the scale pan (weight pan), which is connected with the DMS cell. The scale pan serves as a "product storage", as well as a weighing device. Depending on the product discharge mode, the scale pan after having been filled to meet a certain target weight, is emptied immediately or after receiving external signal, for example for synchronization from integrated form filling sealing machine, or foot switch in the case of manual filling. 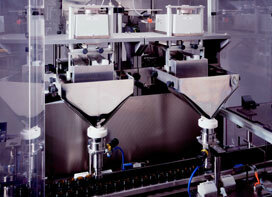 After discharging product, S700 begins immediately with a new product filling cycle. In order to enhance quality control procedures, automatic report generations and communication with optional supervisory computer system ( SCADA ), are available.